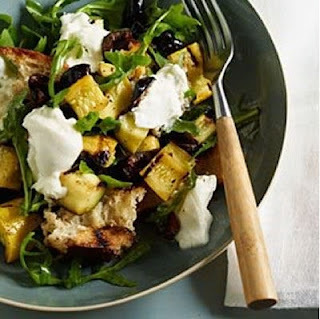 Melissa Good Taste: Salads... Craving Vegetables! I am craving vegetables. Fresh, crunchy varieties on plates with cool dressings and creative garnishes. We are on the road headed back to California and I have had nothing but fast food and Cheetos for the past couple of days. 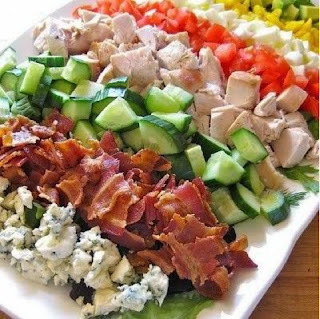 A Cobb Salad with plenty of blue cheese, bacon, turkey, eggs, cucumbers and tomatoes. The dressing would also be blue cheese because the crumbles by themselves are just not enough. 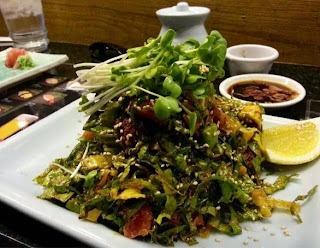 The next salad that rocks my world is the Spicy Seaweed Salad from the Japanese Kitchen in Fresno. The seaweed is combined with lettuce, minced ahi tuna and a spicy dressing that is definitely some blend of sesame oil and Siracha. For mega crunch and more bacon I would create a Broccoli Salad so large that I could enjoy it for days. 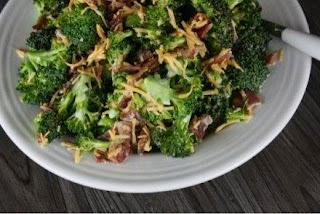 I would chop the broccoli into small pieces, mix in cheddar cheese, bacon, sun flower seeds and for a hint of sweetness; raisins. The dressing would be a creamy mayonnaise base with plenty of lemon and sprinkles of sugar. 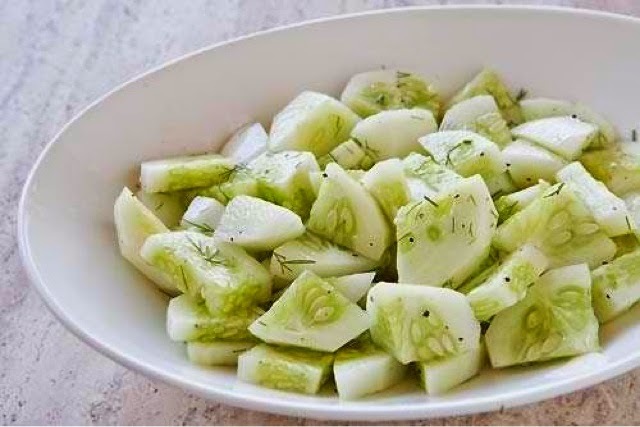 I make Cucumber Salad a lot but my take on it uses a mandolin to slice them very thin. I then boil water, vinegar and sugar together until the sugar dissolves, it doesn't take long. Throw a pinch of dill in the mix, it really makes the salad. Pour the hot liquid over the cucumbers and let marinate and cool in the refrigerator. It keeps for days and is so refreshing. If you are out and about maybe at the mall shopping? 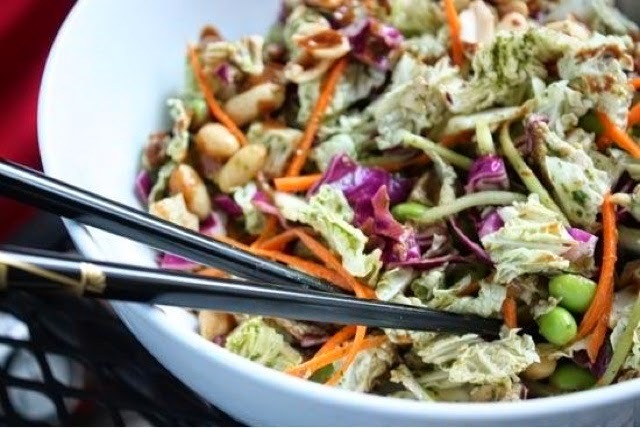 Run into the California Pizza Kitchen to order the Thai Crunch Salad. It was recommended to me by Cowgirl Kate and I have been a fan ever since. 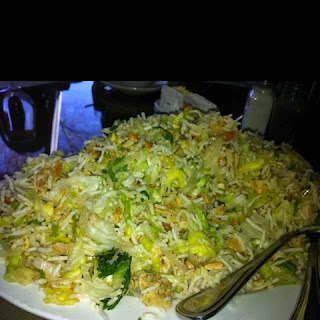 I always ask for additional dressing because it is so tasty. 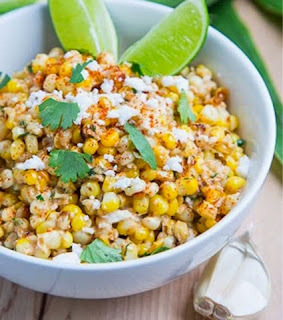 My husband loves corn more than anyone I have ever met. He loves it prepared any which way but my favorite way is like a Mexican Street Corn Cob. Roasted, bathed in mayonnaise, chile, queso fresco and lime. This salad is a perfect play on that and a fork makes it easier for me to shovel in my mouth. Ah... Burrata. I love the silky cheese so much that I would not need any kind of salad paired with it to enjoy. The smooth cheese goes perfectly with arugula and balsamic reduction. I will wait for the long, hot days of summer to produce excellent tomatoes to service with this salad. Serve cool with plenty of olive oil, salt and pepper. And, last but not least - Please excuse the terrible photo - but the Tao Tao's Shredded Chicken Salad in Sunnyvale is what I crave the most. The crispy chicken, air light puffed rice sticks, salty cashews, minced cilantro, finely chopped salad make for a perfect bed for the spicy mustard dressing that cannot be duplicated. This salad is rare, hard to recreate and totally my most crave worthy salad. As miles and miles fly by I will continue dreaming of all things veggie. You never appreciate what you have access to, like fresh fruit and vegetables, until you are forced to grab another bag Hot Cheetos for sustenance. California here I come!